• It used to be the shop sign of the herbalist in medieval times, like striped poles were to barbers and golden balls were to pawnbrokers. • It is one of the first flowers to appear in Spring bringing cheery yellow to a still wintry landscape. • It is fantastic for sore throats (see my post In Praise of Coltfoot) containing many useful phytochemicals. 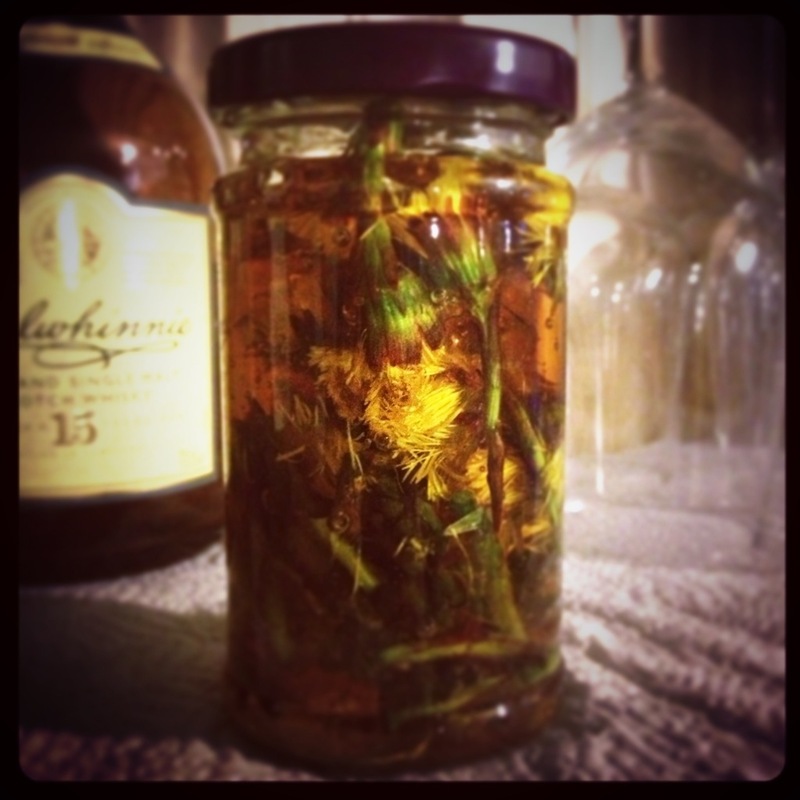 For medicinal purposes with a cough or a sore throat you can make a tea from the leaves, but you can also make coltsfoot flower honey – soothing, tasty and popular with children! Very simply: Snip the flowers with stem attached with scissors on a sunny morning. Fill a clean (sterilised) jam jar to the top with flowers and stems. Cover with good quality runny honey. Seal and put in a warm place or sunny sill for up to six weeks. 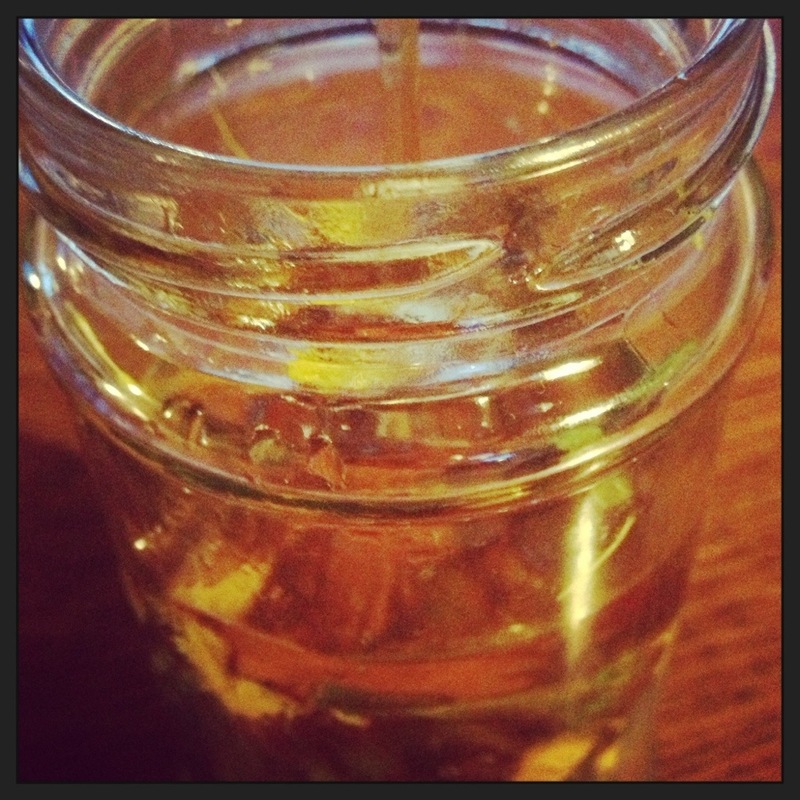 Strain out the flowers (easiest if you warm it to thin the honey first by placing the jar in warm water). Repot in a sterile jar and keep in a cool cupboard until needed. How soon can you use the honey? It depends how strong you want it. If I’m in a hurry I pour warmed honey over and use it even after just a few hours. My coltsfoot honey is fermenting! I washed loam off my flowers and dried them for several hours, then jarred them and poured honey over. 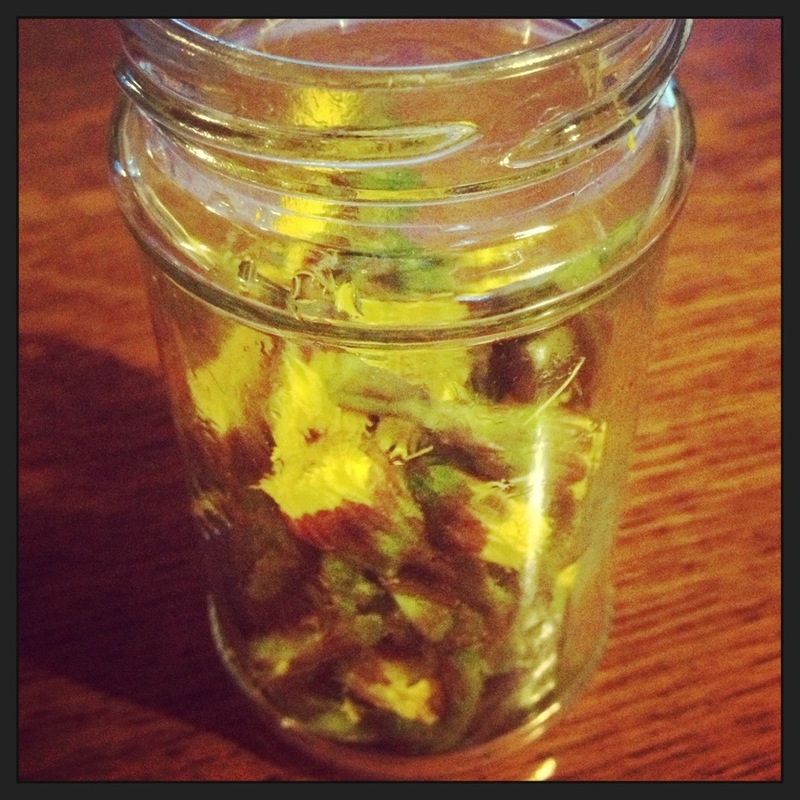 The coltsfoot rose to the top of the jar and has started fermenting. Would this mixture still be good as a mead-like substance? Its been about three days since I picked and harred it. Thanks! That’s the start of a coltsfoot mead then! 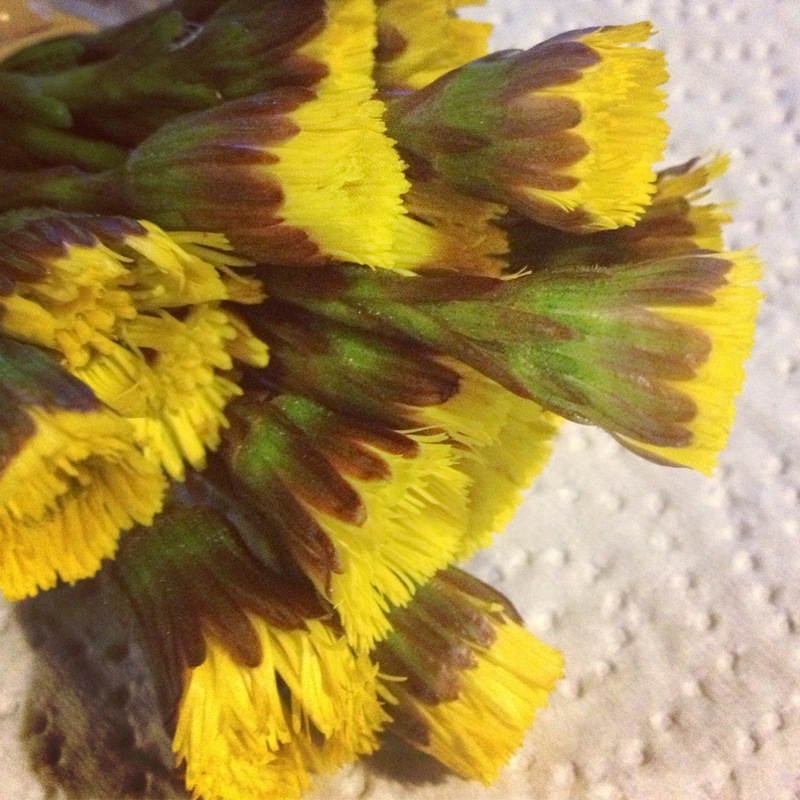 Try to keep the coltsfoot submerged to prevent mould forming on the top. For a full blown mead you’d usually add a yeast nutrient (a teaspoon of Marmite is a good substitute) and some water. Good luck. Thanks much! I have the top on the jar very loosely to let off air, so should that suffice to keep out mold? Do you know how long it would keep once its done? I’ve never made mead! 🙂 Also, do i keep it in the fridge/on the shelf/rebottle it when its done? Thanks so much for your advice!! Well the fact that your honey has started fermenting probably means a low sugar content and mould has a mind of its own, so weight it down until you take it out in a day or two (five days in is ample). While it’s fermenting bubbles will come out and this is best done at room temperature. Once it stops bubbling, you can bottle it. If the alcohol content is high enough it can be stored in a sterilised bottle in a cupboard.